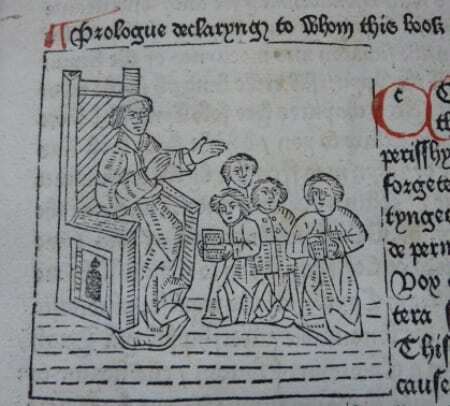 When I first saw this image in the prologue to The Mirrour of the World [SGC RBK M.239] printed by William Caxton in 1480 I thought that the seated figure surrounded by eager readers could be the perfect embodiment of Caxton himself, the man who brought the first printing press to England in the 15th century. Born in England, Caxton’s career began as a merchant and diplomat and he flourished on the continent in Flanders, then under the Duchy of Burgundy. It is here that Caxton became aware of the printing press, a new technology revolutionising the dissemination of the written word making it easier, faster and wider reaching… at least by 15th century standards! Caxton began by first translating popular French works into English himself and printing them for the English market. This process would have been rather time consuming and around 1475 Caxton moved his printing press to England, giving him access to manuscripts written in English which would only require printing. The move to England, however, did not see Caxton abandon French works entirely and in 1480 he printed The Mirrour of the World. The Mirrour of the World is an encyclopaedic volume which covers many topics, including creationism, ‘scientific arts’ such as logic, cosmology and meteorology. Entries are often accompanied by illustrations, such as the above, which were created by the process of relief printing from woodcuts. The required design would first be traced into a block of wood, then the areas requiring no ink would be cut away to leave the trace of the design level with the surface to take up the ink and be pressed for printing. In other words, a bit like the printing you may have done as a child by using a potato with a shape carved into it and lots of paint! The process of woodcut printing was already in existence in Europe prior to the development of the printing press, and had been used for a lot longer in Asia. Other images found in the book are used as diagrams to help fully explain to the reader the subject being discussed in the text. These diagrams include an illustration to explain the then established theories of the Earth at the centre of the universe and the sun’s course around the earth. There also seems to be an attempt to explain what is now known as gravitational forces, with a diagram of four men standing on the four axes of the world and dropping stones down holes beneath their feet which all end up at the centre of the earth. 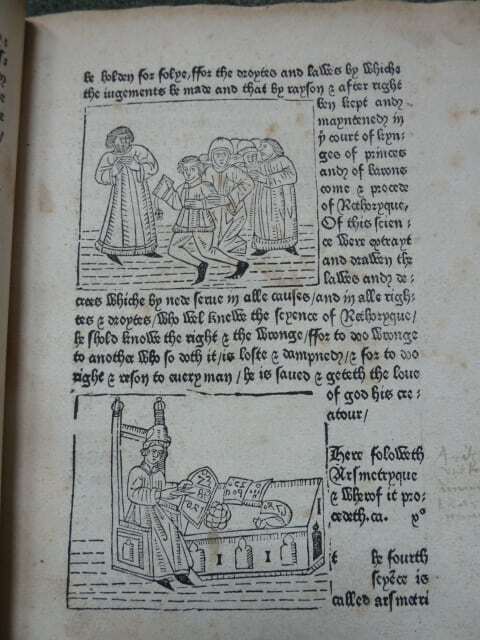 The woodcut images in this work which contain figures of people in action are my favourite for they appear to capture the purpose of the book to, as Caxton states in the prologue, teach and entertain otherwise idle minds and so that ‘thinges passed myght be had in perpetuel memorye and remembraunce’. As well as beautiful and interesting, the illustrations can also be inadvertently amusing. These two images (below) for the topics of rhetoric and arithmetic especially caught my eye: the top figure appearing to shrink in fear from a group of students well-versed in laws and rhetoric, while the bottom figure’s pained expression surrounded by numbers looks very much like myself attempting to do any kind of mathematics (as anyone who knows me will testify!). In addition to the images, the type face used by Caxton looks like a work of art in itself and the language and spelling used throughout the book feels both distinctly archaic and equally familiar. There is also a hint that Caxton’s translation retains an essence of the original French text, such as perhaps can be found in the somewhat unusual description of hell as ‘horryble stynkyng and redoubtable’.